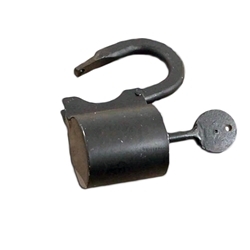 Our Medieval Lock Plain is a perfect accessory for your medieval display or historical re-enactments. Hand made from steel, these medieval locks include a key that turns to lock the lock. These plain locks also suitable for Renaissance and Pirate eras. Inside Loop 2" x 2"